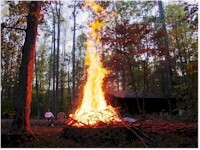 The Meier home is on 7.5 mostly wooded acres in beautiful, historic New Kent County in the Virginia Tidewater. 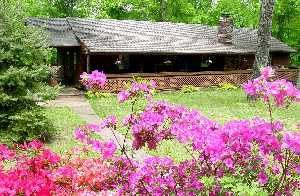 It is a "rustic rancher" in a secluded private setting. Hardwood trees surround the clearing to the front of the house, as well as the sloping rear lot. The property is flat in the front, giving way to a moderate slope, ending in a spring-fed creek. The front yard is ringed with a rail fence and a continuous hedge of various colored azalea, rhododendron and other flowering plants. Long curving gravel driveways provide two connections to the street. There are wide parking aprons both beside and in front of the fenced front yard. Two vehicles can park in the detached garage, and there is space for another in the attached basement workshop/garage. The front of the house has a full length, partly covered porch. A deckway at the kitchen end of the ground floor extends around back, opening into an elevated deck with a sliding patio door. In 2002 a awning roof was added to the west end of the house, covering the kitchen door and walkway. 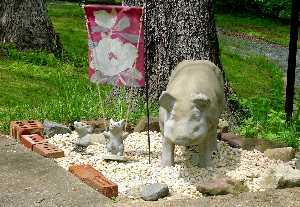 Magnolia the pig guards the entrance. The house was built in the late '70s by Andy Anderson, a current neighbor. The ground floor consists of a large open area, combining kitchen, dining and living rooms under an exposed finished pine tongue and groove roof and poplar beam supports. A central bathroom and master bedroom/bathroom are connected off the open area. Downstairs, the walk out basement contains two more bedrooms (used as hobby rooms), a bathroom, a den area (used as a guest room), a laundry room and a large workshop/garage. A flue provides wood stove connections on both levels. Improvements include: Flooring attic space and installing access stairs, improvements to laundry area, closet storage system installation throughout, updated storm doors, painting the storm windows brown, workshop bench and storage fixtures. One of the upstairs bathrooms has been remodeled to add a corner vanity/medicine cabinet. In 2002 the aging dish washer and wall oven were replaced and a central vacuum system installed. A New Englander wood stove was added upstairs in January 2002. In 2002 the heat pump was replaced with a 13 SEER Amana unit. New carpeting was also installed in the downstairs hall and sewing room, as well as on the basement stairs. A new ceramic cooktop followed more recently. A simulated ceramic tile laminated floor went into the laundry area in winter 2003. Five different custom shelving units have been constructed to fit various wall spaces in the upstairs. These hold books, tapes, CDs, DVDs and collectibles. External improvements include a timber border around the driveway parking areas. The driveway gravel has been renewed a couple of times. The rotting crosstie wall has been replaced by a 500 block retaining block wall. In 2001 the external garage was upgraded with a floored loft area, pull down stairs, a wide garage door/opener and a paved floor. In 2002, the porch was rebuilt to increase the pitch and a new 50 year roof was installed on both the house and garage. All three skylights were upgraded as well. The deck and walkways now have corrugated metal installed underneath to divert rain water away from the house. The area under the rear deck has been enclosed to form a drive through tractor shed. 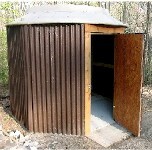 A "yert" style storage shed using a surplus 10 foot diameter solid aluminum dish antenna as a roof was constructed in Spring 2003. Added in summer of 2003 is a carport roof structure extending out from the attached garage. Alongside of this is a 12 foot "bat walk", complete with "Bat Crossing" warning sign. A second carport area was added fall 2003. 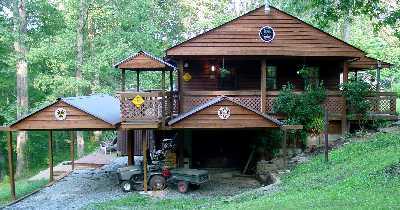 A lower 6 X 30 ft. lower deck area was added in summer 2003 behind the house. This new deck extends out to the edge of a garden pond (see below). In summer 2004 a roof was added to the "bat walk". A decorative flag holder has been added to the end of this roof. 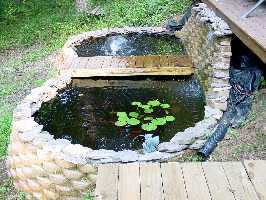 A 2000 gallon garden pond was commissioned in June 2004. Sarasa comets (a type of goldfish) and several water plant varieties are now becoming established. In the picture please note the fountain at the far end, the central service bridge and the gargoyle "spitter" at the near end. Natural stone is used to decorate the top edge of the pond and to form a waterfall feature. Much work still needs to be done to landscape the area around the pond, which was previously an eroding steep slope covered in vines and weeds. A second walkout structure was constructed in 2005 to provide an overhead view of the pond from the upper deck level. The stair steps between levels on the west side of the house were rebuilt using retaining wall block and cement. A lot of effort in late 2005 and eary 2006 was made to clean up accumulated layers of dead leaves. A 10 foot diameter ring of retaining wall block was build to contain the burning of huge quantities of leaves. The central large oak in the front yard died and was felled, cut up and split, providing more thatn enough fire wood for the winter. A concrete mass was discovered inside the healed-over trunk. Tree rings indicated that the patch had been made about 50 years ago in a 75 year old tree. 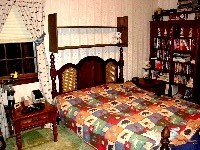 Inside, additional shelves were built and installed for books, CDs and for the display of collectibles.